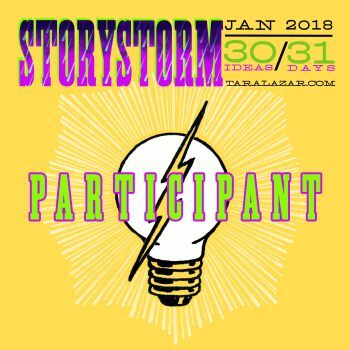 Tara Lazar’s STORYSTORM 2018 will start tomorrow! Thanks to this annual event (formerly known as Picture Book Idea Month), I have come up with numerous story ideas over the last few years, including one that became my third published book, Macaroni and Cheese for Thanksgiving, and also Amos Faces His Bully, which will be released by Guardian Angel Publishing in 2018. The children’s story I recently wrote at writing group also came about thanks to this challenge. Any writer interested in brainstorming new story ideas in January is invited to join. Any genre, any style; student, amateur, hobbyist, aspiring author or professional. Register at Tara’s blog by signing your name ONCE in the comments on the registration post. Registering makes you eligible for prizes. Visit her blog daily (taralazar.com) in January for inspirational essays by guest bloggers—professional authors, illustrators and experts in creativity. Instead of visiting the blog directly, you can receive the daily posts via email by clicking the “Follow Tara’s Blog” button in the left column—look under her photo for it. After you have read the daily inspiration, jot down a daily story idea in a journal (the annual CafePress journal will be linked when ready), computer, anywhere you like to write. Some days you might have no ideas, but some days you might have five or more. At the end of January, if you have at least 30 ideas, sign the STORYSTORM pledge she posts and qualify for prizes. Prizes include professional consults, signed books, original art, writerly gadgets and gizmos. In previous years, I’ve posted my ideas here on my blog. This year I’ll track them on my computer and give a weekly update on my progress.